Agglutinins are antibodies that cause the red blood cells to clump together. Cold agglutinins are active at cold temperatures. Febrile (warm) agglutinins are active at normal body temperatures. This article describes the blood test that is used to measure the level of these antibodies in the blood. There is no special preparation. When the needle is inserted to draw blood, some people feel moderate pain. Others feel only a prick or stinging. Afterward, there may be some throbbing where the needle was inserted. 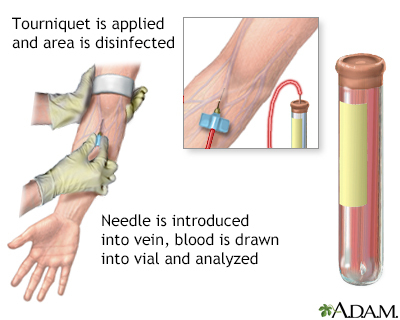 This test is done to diagnose certain infections and find the cause of hemolytic anemia (a type of anemia that occurs when red blood cells are destroyed). Knowing whether there are warm or cold agglutinins can help explain why the hemolytic anemia is occurring and direct treatment. An abnormal (positive) result means there were agglutinins in your blood sample. Brucellosis is an infectious disease that occurs from contact with animals carrying brucella bacteria. If a disease linked to cold agglutinin is suspected, the person needs to be kept warm. Baum SG. Mycoplasma infections. In: Goldman L, Schafer AI, eds. Goldman-Cecil Medicine. 25th ed. Philadelphia, PA: Elsevier Saunders; 2016:chap 317. Michel M. Autoimmune and intravascular hemolytic anemias. In: Goldman L, Schafer AI, eds. Goldman-Cecil Medicine. 25th ed. Philadelphia, PA: Elsevier Saunders; 2016:chap 160. Michel M, Jäger U. Autoimmune hemolytic anemia. In: Hoffman R, Benz EJ, Silberstein LE, et al, eds. Hematology: Basic Principles and Practice. 7th ed. Philadelphia, PA: Elsevier; 2018:chap 46.